If you’re one of those users who’s tried every possible size and shape of mouse to no avail, perhaps you’ve dreamed of a way to use the computer that doesn’t involve your hands at all. Head tracking, perhaps? Voice control? While these technologies show promise, there’s an even simpler, purely mechanical way to accomplish the same goal. In concept, it’s little more than a giant mouse that fits on your foot like a shoe. Don’t laugh. A company called Bili has been selling it for years. Subtly enough, they call it the Footmouse. Using a Footmouse is like driving a stick shift – your feet have to work together. (Fortunately, not even the worst Footmouse driver can destroy the transmission.) 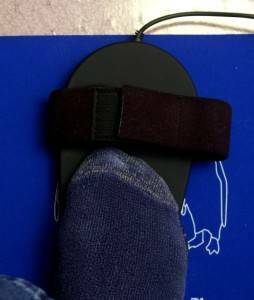 Your “accelerator” foot goes on the slipper, which you slide around the floor just like you would move a regular mouse on your desk. Your “clutch” foot is positioned over a sloped plastic box that sports five huge buttons and a scroll wheel. With the slipper plugged into the box, and the box plugged into your computer, you’re ready to go. 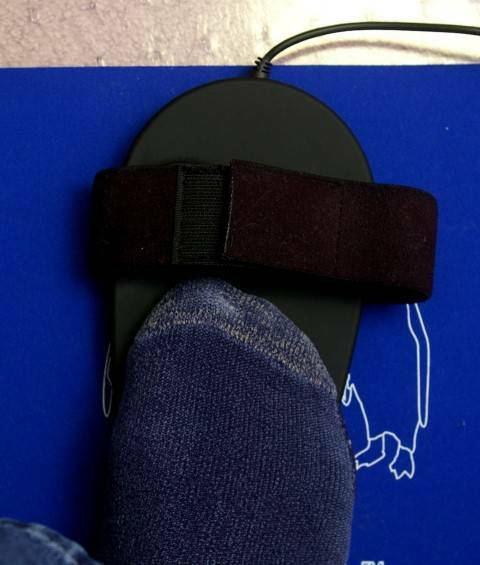 Before I tried the Footmouse, it was hard for me to imagine moving a pointer accurately with my foot. Having tried it, I’ve reached two basic conclusions: 1) It’s possible; and 2) It’s difficult. A long time ago, I got my first driving “experience” with Sierra’s Driver Education software. (Raise your cane if you remember that one.) I vividly recall the last “lesson.” To discourage teens from DWI, the car settings were changed to simulate inebriation. Steering was slow and exaggerated; braking was erratic. I wrecked in short order, and thus obtained my diploma in future sobriety. 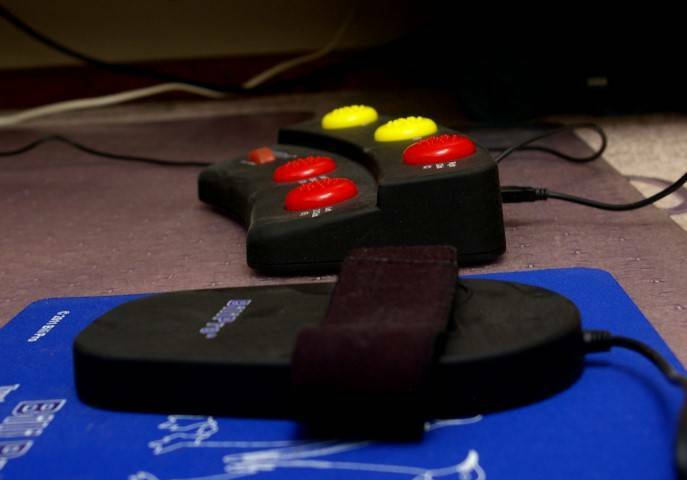 In a weird way, using the Footmouse reminds me of that final Sierra driving lesson. I’m in control, yet not in control. I can send the pointer where I want it, but sometimes I feel like I’m pleading with it to go there. The difference, obviously, is that you can’t wreck a mouse pointer. Eventually, the job gets done. I can start and use programs. I can select text. In a slow, awkward, thigh-aching way, I can be productive. And if I were as bad off as some people in the carpal tunnel department, slow productivity might represent a pretty big improvement. The best way I’ve found to use the Footmouse is barefoot, or wearing socks, with the heels of both feet planted on the floor. I essentially move the mouse with the toes of my right foot, rather than trying to rest my whole foot on the slipper. The latter approach is shown in the literature, but how anyone does it with any degree of accuracy is beyond me. Is it trolling to scroll with your toes? If there was one feature I’d have thought difficult to implement with a foot-operated mouse, it would be scrolling. Ironically enough, the scroll wheel is the one part of this device that I really like a lot. In an innovative twist (literally), its motion is side-to-side rather than front-to-back. Positioned in an easy-to-find spot on the near corner, the wheel is a breeze to work back and forth with your non-dominant foot. The Footmouse sports five full-size buttons on its deck. In case these don’t give you enough flexibility on their own, you can download some free software called “Footime” to program them for custom functions. And in case that’s not enough flexibility, you can customize these functions per program on your computer. I didn’t spend a very long time trying the Footime software, so I don’t know how well it would work for daily use. It struck me as adequate, but a little dated in its defaults. Chrome, for example, wasn’t automatically recognized as a web browser. Also, Footime appears to make the Windows logo key non-functional, which is a big drawback for me personally. If your hands are still more or less in working order, I suggest that you exhaust other options before resorting to the Footmouse. For me, the thing is just too challenging to be attractive for daily use. There could be some applications for this device outside the disability market, such as heavy industry and computer gamers. 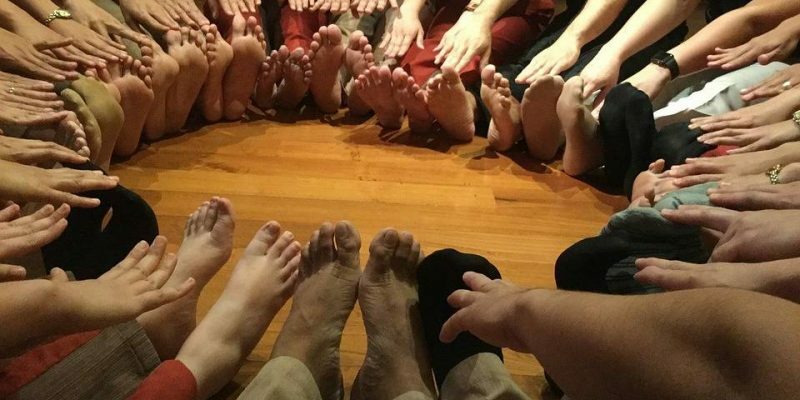 But mainly I see the Footmouse as a tool for those with no other options – and if that’s your situation, it could be a very welcome tool indeed. Disclosure: This review was made with a complimentary sample from Bili.